The first time Slifer was summoned, his master was but a mere babe. The first time he was summoned, his prince was a mere babe. He burst into existence in his full glory, a dramatic entrance wreathed in lightning and thunder. He roared, his double voices echoing throughout the land and shuddering the very earth. He looked down, expecting to see some bloodied battlefield filled with heathens to bring his heavenly wrath upon. Instead, he met the very frightened gaze of a straggly cat, which bounded off as it screamed in terror. The serpent-god blinked, if anyone else had gazed upon the befuddled expression on his double maws they’d no doubt laugh in amused terror seconds before fainting dead over. Over the sound of his thunder and coils rasping together, he heard the smallest sound - sniffles. Bringing his great head around, he found the one who had summoned him - not a King, no, not even a confused Magician. Instead, he found himself face to face with the smallest being he had ever seen, a small child clutching its own paws; wide, watery cerise eyes staring up at him. The child startled, gasping in the way small children do, before bringing a paw up to its maw and suckling on one of its digits, eyes watering up the point of gushing over as a few frightened hiccups shuddered out of its chest. 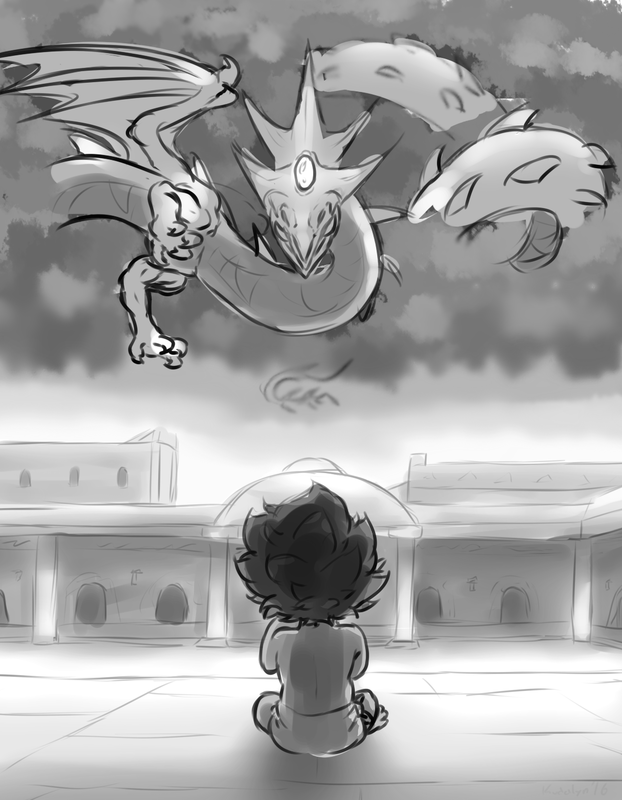 The sight of his summoner being so terrified of its own creature, no matter how small and squishy and helpless it was, didn’t sit well with the serpent-god. The great god found himself manipulating his form, coils shrinking and thunder and storm fading till he was no more than the size of a large dog, placing his heavenly form on the ground - the ground! - before his small master. The child was still staring at him, eyes still overflowing down its cheeks - but at least it was too surprised to cry anymore. Digit still stuck in its maw, suckling away, it reached a tentative, shivery paw out towards the serpent-god’s minute form, digits wriggling in curiosity. It was then that the god saw wounds - a few slight scratches across his master’s paw that didn’t appear to be very deep, but bled all the same. His thought flickered back to the cat - it must have been a stray that wandered into the palace, and had viciously reacted to the pup’s friendly curiosity. Despite just having been wounded, and startled stiff at the mighty appearance of his heavenly self, the child was still reaching out in curiosity and kindness towards him. What a bright soul. The serpent-god couldn’t help but open his lower maw, licking a stripe with his heavenly tongue across the child’s wounds. The child gasped at the warm sensation, before reaching once more and patting at the god’s snout. The god couldn’t help but snort, a much smaller, less threatening sound than before, and was startled when the small child gave out a watery giggle around its digit. Removing its paw from its mouth, fingers still slick in its own saliva, the creature promptly reached forward and grabbed the god by the tusks, dragging his head down and towards the child even as he balked and resisted. The child had such strength for such a diminutive size! Next thing the god knew, he was being pet like a mere mortal creature, his muzzle being stroked and patted and squeezed while his master-pup babbled away excitedly at him, eyes bright and sparkling and dry. The god snorted in surprise against the child’s belly - earning a delighted giggle from the pup - and tried to lift his head away from his master, only to lift the child clear off the ground when the pup had gripped at his mantle with its surprisingly strong paws, its small pudgy feet dangling and kicking in joy. The serpent-god gave a warning grumble - he was no play-thing! He was a heavenly being meant to smite the foes of his masters! But clearly his current diminutive master didn’t know that - or much care - for it was promptly hauling itsself over his head, using his magnificent crown as paw-holds till it was laying across his whole head, now distracted by the shiny gem embedded within the serpent-god’s crown. There was no helping it, the god supposed, rolling his heavenly eyes and lowering himself further till he laid out on the sun-baked ground - so that if his master-pup moved, it would not fall far and hurt himself. The serpent-god couldn’t remember the last time he just sat and… relaxed, he supposed. His entire existence was based around destruction and protection, smiting foes and ensuring the holy royal bloodline kept flowing undisturbed. He had never in his infinite existence been summoned by and reduced to the playmate of a babbling child-king. But as the child kept talking to him in its nonsense words, obviously delighted and trusting of his new ‘friend’ the god decided that perhaps, this wasn’t all a bad thing. It was quite a few handful of mortal-moments later that an adult finally came by, obviously frantic in its search for his small master-pup. And finally, he got an appropriate response - the adult-mortal gave a high pitched scream and ran off at the sight before them. The oh-so-terrifying sight of the great heavenly serpent-god laying his great, shrunken coils out in the sun while his master-pup played between his paws, fingers curiously stuck in his maw and playing with his tongue. He couldn’t for the life of him figure out why his master-pup was so absolutely enamored by his open maws, having been playing with his upper maw only moments before sticking its slick digits between his lips and hauling his lower maw open, practically crawling inside while it still babbled excitedly. This master was quite the talkative one, it seemed. The sound of multiple footsteps thundered down the hallways of the palace a few moments later, and he met the startled gaze of the current King, his now previous master since the young prince-pup had managed to summon him. The King gaped like a suffocating fish for a few moments in shock, the serpent-god having to refrain from allowing a dark grin to sneak across his muzzle. This King had only managed to summon him once, and it nearly killed him with the amount of energy it took. For his offspring - a mere pup - to be able to summon a great being such as himself at such a tender age, and be absolutely healthy and showing no signs of being tired at such a feat… the great god found himself wondering if his old master would be proud, or envious of his own offspring. Seeing as how his old master could no longer control him, and his current master was in no shape or of any inclination to allow him to return to his own realm, the serpent-god took it upon himself to call their time to an end. Giving a great sigh, he pulled his head away from his master-pup, the child whining that its plaything was being taken away from it. He looked down at the pup, who was nearly coated from head to toe in his heavenly saliva, and decided - this master was going to be a good one. He got to his feet, allowing himself to nuzzle the small pup with his snout one last time, but pulled away before the child could latch onto him once more. Rising off the ground, he turned and departed, doing his best to ignore the disappointed and sad cries of his master-pup as he resumed his true form, his great crimson coils extending and filling the sky once again. He gazed down, his small master appearing even smaller now, but he was able to spot it staring up at him sadly moments before it was swooped up into the arms of servants, pulling it back and stressing and cooing over it, making faces at its saliva-soaked form. He snorted. The mortals should feel blessed that they’re getting to touch something so intimate from his heavenly self, something so freely given to one so worthy. Allowing his form to dissipate and return back to his own realm, thunder rolling across the skies, he found himself looking forward to the next time he was summoned by his master-pup. Though he honestly hoped the pup was old enough by then not to want to stick his paws down his throat once more.